It's getting easier to find the conspiracies all around us. Just look at the news. 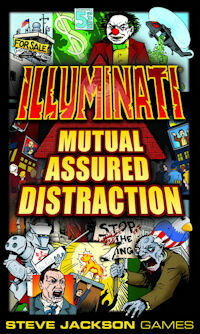 Illuminati: Mutual Assured Distraction is about today's headlines. Supermajority, Health Reform, Bank Collapse, Superpatriot Act, Economic Stimulus – they're tools for world control. You knew it all along, didn't you? This set introduces "New World Order" cards to the classic Illuminati game. A NWO card affects all the players, not just the one who put it down. This mechanic first appeared in the collectible card version of Illuminati. You liked it then – so here it is for the original game. 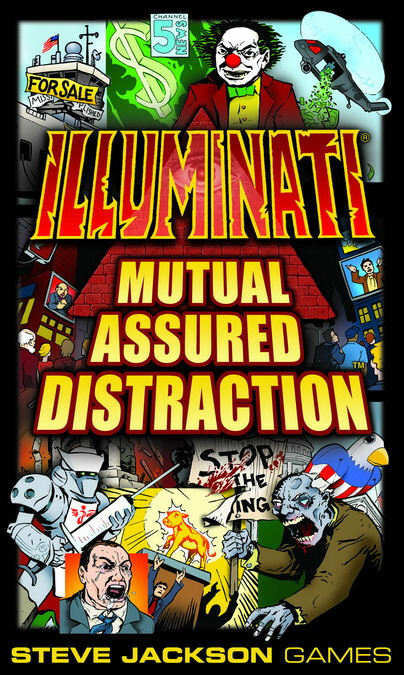 Illuminati: Mutual Assured Distraction contains 18 NWO cards to boost, penalize, and offend major political and social groups of all kinds. There are also five special cards to trigger, add, or remove NWO effects.